Get a look at a new alien world from Thor: Ragnarok. Finn gets a shiny new weapon in The Last Jedi. The Defenders showrunner teases some big action for Sigourney Weaver’s villain. The best candidate for Doctor Who’s next Doctor drops out of the race. Plus, new Transformers: The Last Knight footage. Great Hera, the Spoilers are here! Blink and you might just miss what is actually our best look yet at the movie’s big bad, Ares, in a new TV spot. Meanwhile, you can rest easy: the new Wonder Woman has Lynda Carter’s seal of approval. 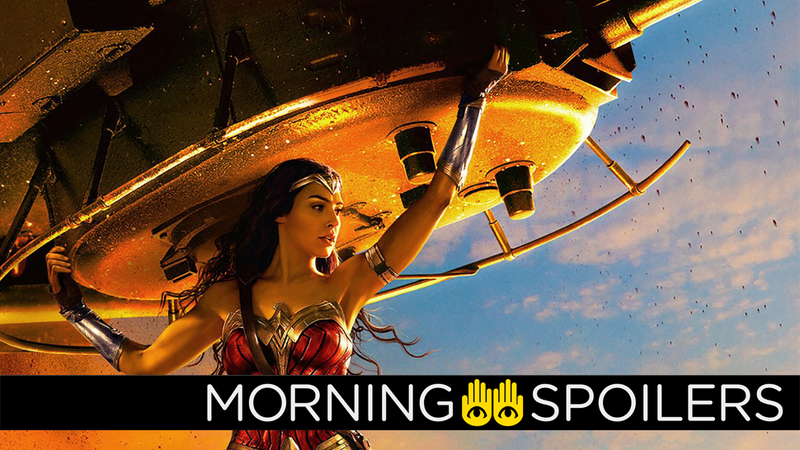 Finally, for Wonder Woman, Diana faces her biggest challenge in Man’s world in a new clip: a revolving door. John Boyega reveals Finn’s fancy blaster pistol from the movie in a new Instagram post. The first set pic of Aquaman and Mera together has surfaced. A scale model on display in Brisbane, Australia (alongside the Hulk’s ginormous bed) gives us our first full look at Sakaar. Michael Keaton sits down with Ellen DeGeneres to discuss Vulture’s role in the film. Meanwhile, Michael Giacchino’s score is now available for pre-order on Amazon. Head over there to see the track list— and how the film’s events chronologically unfold, in Giacchino’s trademark goofy track title style. Also, the Spider-Man TV show theme is in there, so this amazing music is seemingly in the film after all. And here’s another intense one, featuring exploding knights, objects in space and Optimus Prime body-slamming Bumblebee. [Weaver] said, ‘I’ve never been a martial arts kind of gal, I’m more of a hold-the-flamethrower kind of gal.’ I’d love to tattoo that interaction onto my forehead forever. She was really willing to do things, to really get dirty, it was wonderful. Floriana Lima will return as Maggie next season, but only in a recurring capacity. According to TV Guide, Tasya Teles’ Echo will be a series regular in the next season. Liv eats the brains of a conspiracy theorist in the synopsis for episode 11, “Conspiracy Weary”. Liv (Rose McIver) and Blaine (David Anders) come to the rescue of one of their own. They consume the brains of a conspiracy theorist and paranoia ensues. Meanwhile, as they continue to search for conspiracy theories that may or may not exist, Liv researches Major’s (Robert Buckley) new friend. Finally, Ravi (Rahul Kohli) makes a surprising discovery of his own. Sad news: Hayley Atwell told GeekFeed that she’s no longer interested in playing The Doctor. I don’t want to play it. No. It’s just not my thing, but I really respect it. I’m a big fan of Phoebe Waller-Bridge, though. She plays the lead in Fleabag. There were talks of her being the next Doctor, and she’s so funny and eccentric and unique; she’d be great. I can’t really see anyone other than her playing it. In happier news, Rachel Talalay revealed she’s directing this year’s Christmas episode, Peter Capaldi and Steven Moffat’s last on the show. The Doctor, Bill and Nardole arrive on Mars, and find themselves in an impossible conflict between Ice Warriors and Victorian soldiers. As the Martian hive awakens around them, the Doctor faces a unique dilemma - this time the humans, not the Ice Warriors are the invaders. When Earth is invading Mars, whose side is he on? And here’s one for this week’s episode, “The Lie of the Land” — and its trailer, in case you missed it.